planet manners: USA & beyond: Fillet of lion? USA & beyond: Fillet of lion? Help keep African lions in the wild, and off the menu. Would you like a lion taco? How about "lion skewers"? I wouldn't either, but that has not stopped some restaurants in the United States from offering this on their menu. And it's completely within the law. Right now, lions are being raised on "exotic game farms" for sale to restaurants, or virtually anyone else with a taste for lion. Because African lions are not yet federally protected, there is nothing to stop this gruesome practice. Help us protect lions from being raised for their meat with a $20 donation today. Lion cubs are raised for public-display purposes and adults from these breeders often end their lives in slaughterhouses. With lions in the wild rapidly disappearing, it's appaling that this remains legal. Lions have disappeared from over 80% of their historic range, and their population declined by nearly 50% from 1980 to 2002. Alongside our member organizations, we are working to obtain long-overdue Endangered Species Act protections for African lions. But we're not there yet, the U.S. 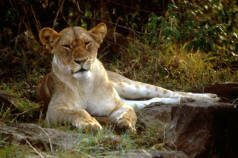 FIsh and Wildlife Service has yet to protect African lions. Help take lions off the menu! Support our work to prevent this abhorrent trade. The United States is by far the world's largest importer of both commercially traded African lion parts and lion trophies. This trend is only increasing. Allowing African lions to be raised, slaughtered, and sold for meat compounds this problem by increasing the market for lions and forces these lions into a life of suffering. Help get lions the protections they deserve. Please donate $20 today. With your help, we will continue to work to see that African lions are protected under the Endangered Species Act and that lion meat is off the menu. Thank you for your ongoing support of wildlife and wild places.